One night when we were in our room on Lord Howe Island, we heard a scratching noise at the front door. On investigation this proved to be a juvenile Flesh-footed Shearwater from a nearby nesting colony attracted by the light. This one, first photo, is almost complete fledged with traces of fluffy down still apparent. In the region of 20,000 to 40,000 pairs of Flesh-footed Shearwaters nest on Lord Howe. They dig nesting burrows in the sandy soil of the forest, mainly in the lowland area where the settlement is situated. Adults come ashore under cover of darkness to nest, change incubation shifts and feed their partners and young. They make their presence known by making loud crooning noises that sometimes sound like cats fighting but during daylight, they are silent and there is usually little sign of them on the island. We were there at the end of the breeding season. When the juveniles are fledged, their cosseted existence comes to an abrupt end as the adults stop coming ashore and the young are abandoned to fend for themselves. Eventually, they wander out of their burrows and (mostly) make their way to the sea to start an independent pelagic life. Lord Howe is the only colony of this species on the east coast of Australia, but there are other colonies on islands off South Australia (one), Southwest Western Australia (several), New Zealand and St Paul Island in the South Atlantic. 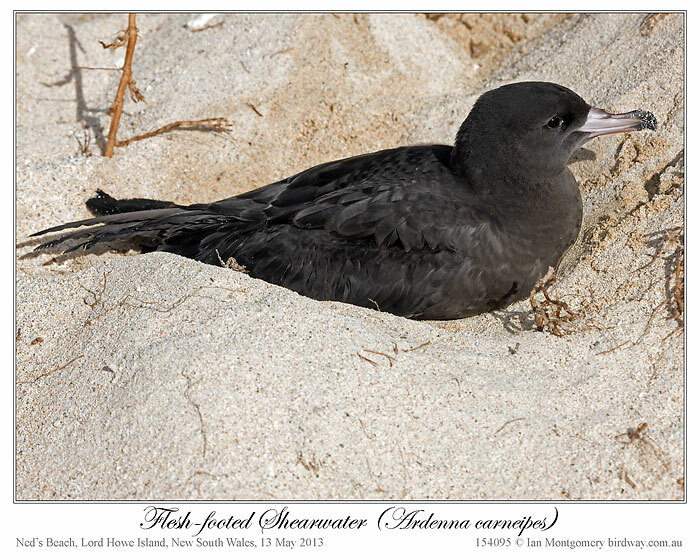 The following day, we found another fledged juvenile when we went to Ned’s beach for a snorkel, photos 2 and 3. This one seemed to have failed to make it down the beach and was presumably waiting for darkness. 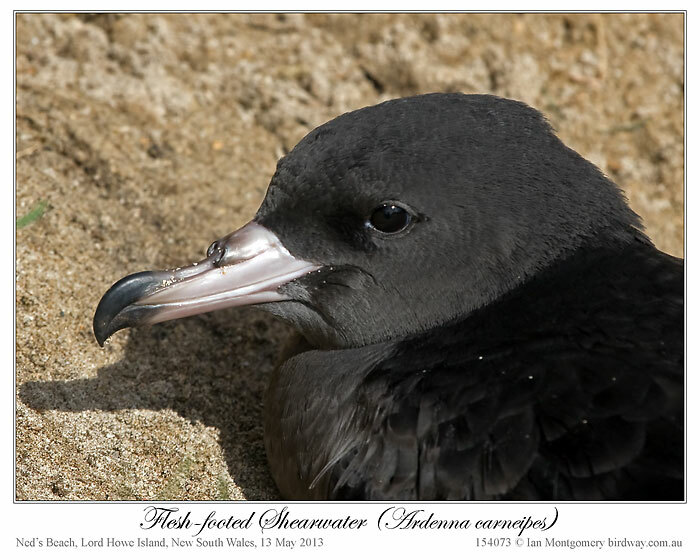 The Flesh-footed is one of several rather similar, mainly dark shearwaters breeding in Australian waters and the third photo shows its two-toned bill – horn-coloured with a dark tip which is its most obvious field mark. 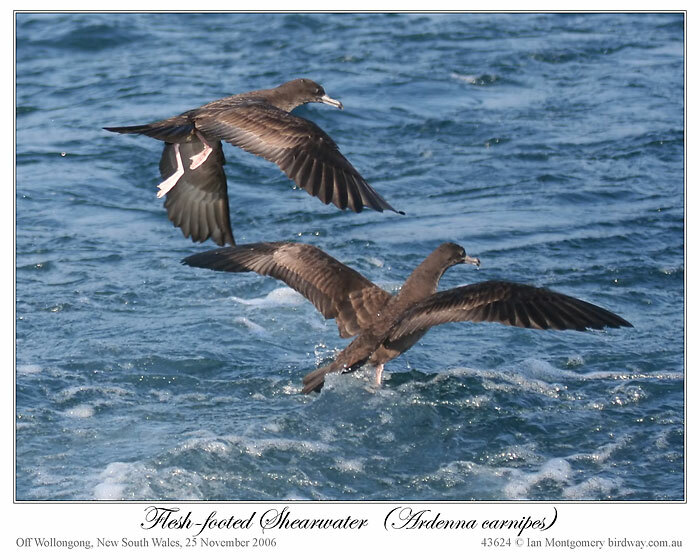 Outside the breeding season, Wedge-tailed Shearwaters are pelagic and range widely in both the Pacific and Indian Ocean. Birds from Lord Howe and New Zealand migrate north to the waters off South Korea and also appear off the coast of North America. The two in the fourth photo were off Wollongong, south of Sydney, in the deep water beyond the continental shelf. In this photo you can see the two-tone bills and the pink legs and feet. 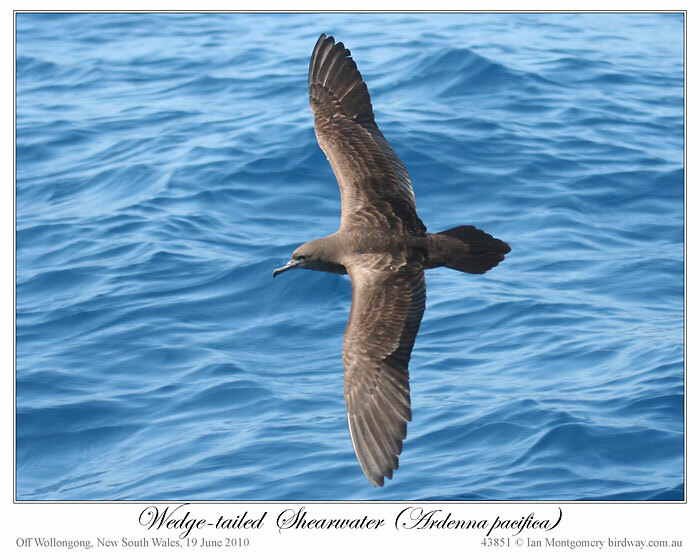 Here, photo 5, for comparison is a Wedge-tailed Shearwater. Note the grey bill and longer, more pointed tail. The third common species in Australia is the Short-tailed, but, true to its name, the feet extend beyond the tip of the tail in flight. All these species are collectively called “muttonbirds” and were harvested in large numbers by early settlers for their eggs and oily, rather salty flesh. Clumsy on land and foolishly trusting, they were never rated as very bright. They are, however, masters of the air and sea and their annual movements around the oceans of the world ending up on tiny specks of land like Lord Howe are impressive feats of both navigation and endurance. The family Procellariidae is a group of seabirds that comprises the fulmarine petrels, the gadfly petrels, the prions, and the shearwaters. This family is part of the bird order Procellariiformes (or tubenoses), which also includes the albatrosses, the storm-petrels, and the diving petrels. The Flesh-footed Shearwater, Puffinus carneipes, is a small shearwater. Its plumage is black. It has pale pinkish feet, and a pale bill with a black tip. 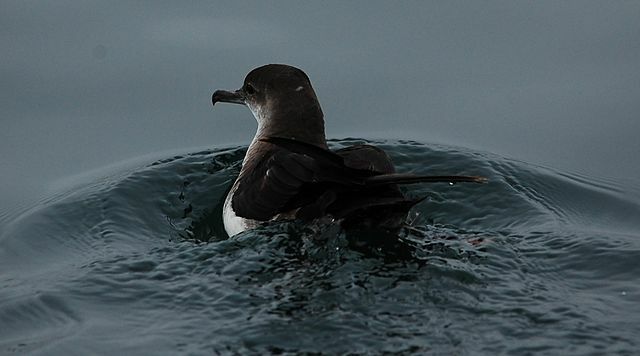 Together with the equally light-billed Pink-footed Shearwater, it forms the Hemipuffinus group, a superspecies which may or may not have an Atlantic relative in the Great Shearwater. 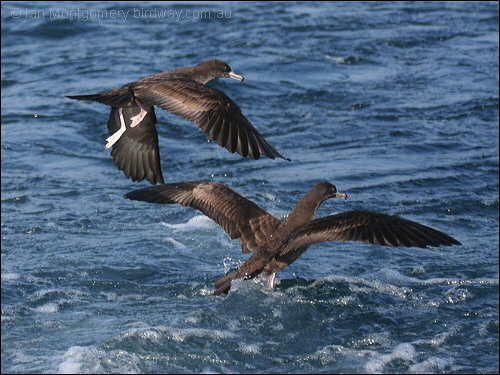 These are large shearwaters which are among those that could be separated in the genus Ardenna. 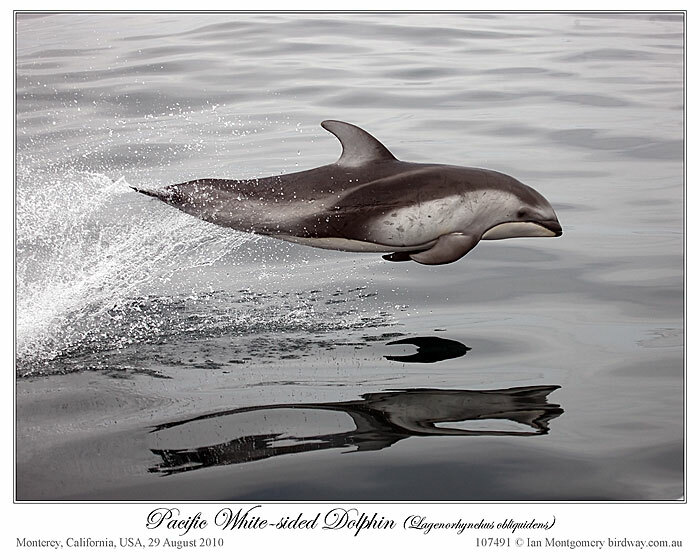 I went on a pelagic boat trip from Monterey shortly after my arrival in California. 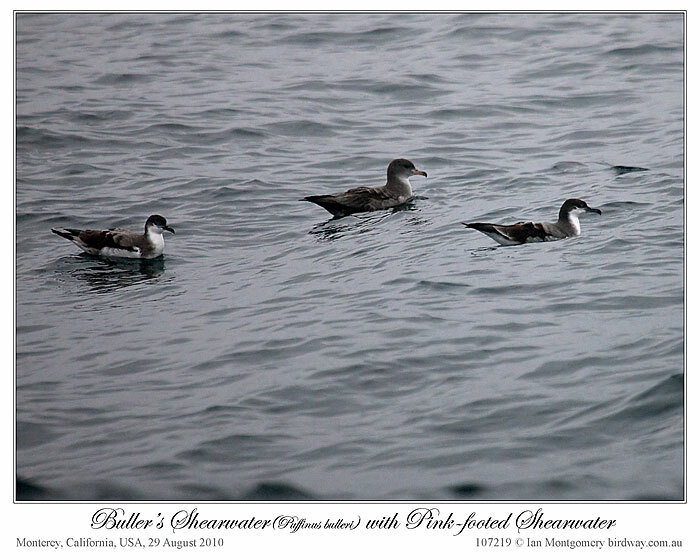 Buller’s Shearwater was one of three species of Shearwater that we encountered in quite large numbers. The others were the Sooty and the Pink-footed. All three are on the Australian list, though the Pink-footed, which breeds off the coast of Chile, is extremely rare in Australia. Buller’s breeds on islands off New Zealand and both it and the Sooty (breeds in New Zealand, the Falklands and Tierra del Fuego) are regular visitors to both Australia and California in the their annual circuit around the Pacific. Having myself just endured a flight – with considerable artificial aid – across the Ocean, I couldn’t help but be very impressed. I’ve chosen Buller’s as it is the most elegant and distinctive of the three with very white underparts (first photo), a well-defined black cap, and M-shaped dark markings on the otherwise grey upper surface of the wings (second photo). With a length of 46cm/18in and a wingspan of 100cm/40in it is intermediate in size between the smaller Sooty and the slightly larger Pink-footed. 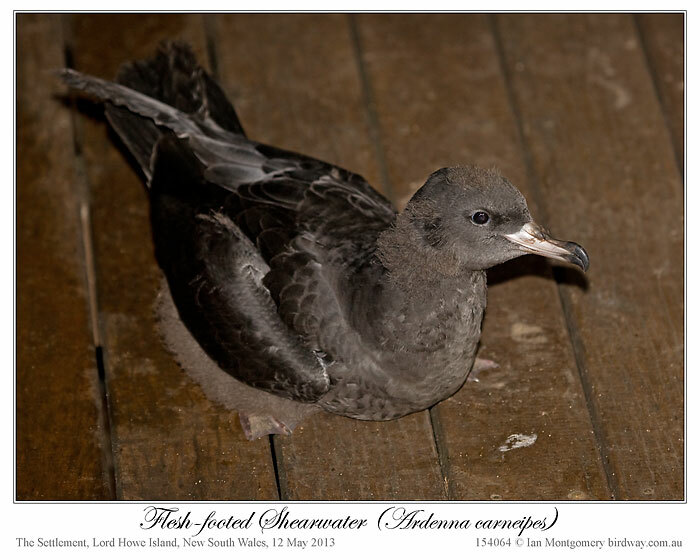 Incidentally, Buller’s Shearwater is the 600th Australian species to be included in the website. 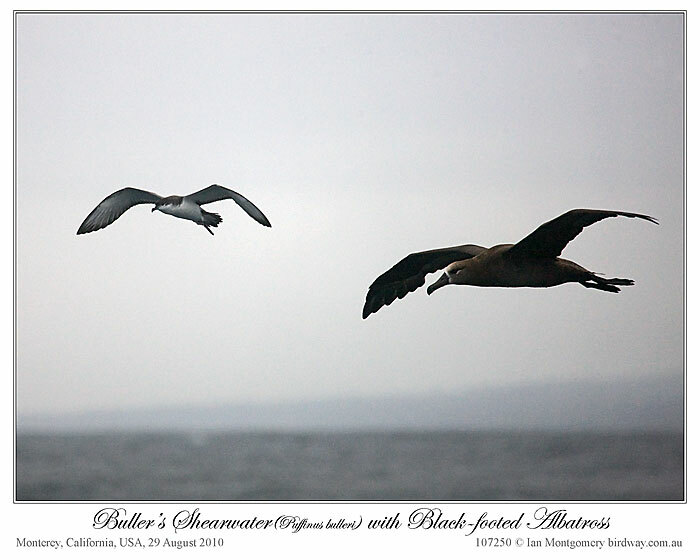 We encountered all three mainly in flight, but also swimming on the surface in mixed flocks. The third photo shows two Buller’s and a Pink-footed. The Pink-footed also has a pale body, but the contrast is less marked and, in flight, the dorsal surface of the wings are relatively uniform in colour. The Sooty, is dark all over except for paler underwing patches. Another common bird on the trip was the Black-footed Albatross, which nests on islands off Hawaii. 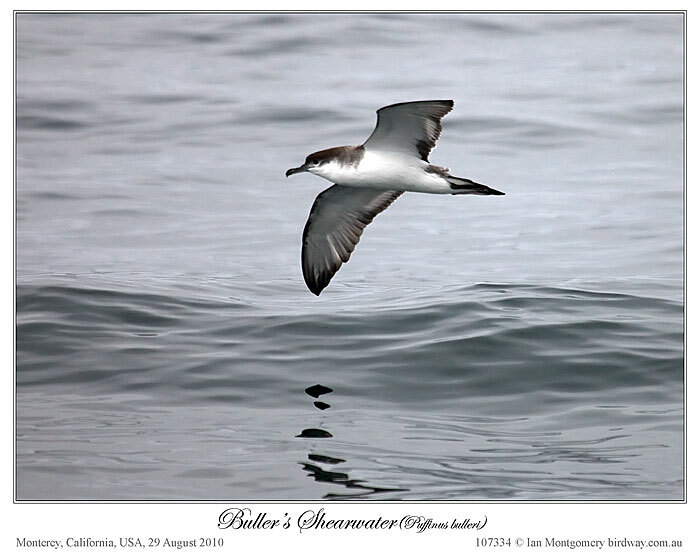 The fourth photo shows one flying alongside a Buller’s Shearwater and it has about double the wingspan – around 2m/80in – and is comparable in size to the Australian Mollymawks such as the Shy Albatross. Relatively calm seas with a 2m/6ft swell were ideal for the trip, but it was overcast and rather gloomy for photography. Photo of the day wasn’t a bird but a Pacific White-sided Dolphin, fifth photo, which obligingly soared out of the water when I was idly following it underwater in the viewfinder of the camera. Whales were very much in evidence with Hump-backed, Fin and Blue Whales and a few days later I photographed Grey Whales farther up the coast. Consequently, I’ve added a section on Cetaceans to the Other Wildlife part of the website. Another great adventure for Ian and what a shot of that Dolphin! Perfect timing. Great bird shots also. 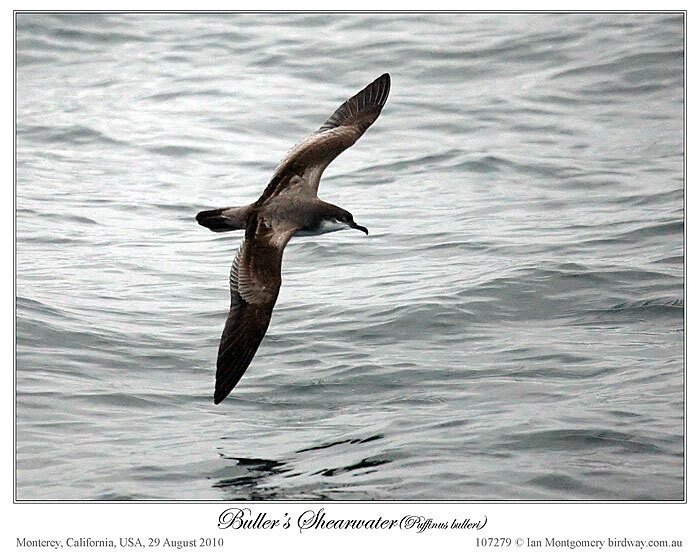 The Buller’s Shearwater is in the Procellariidae – Petrels, Shearwaters Family. 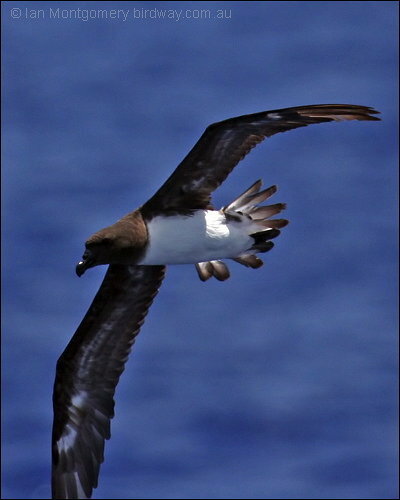 At present there are 86 species in the family including the Petrels, Shearwaters, Fulmars, and Prions. 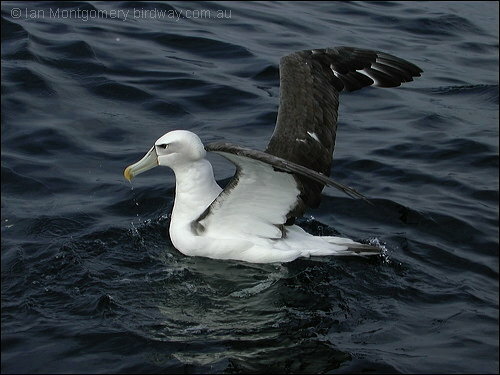 They are part of the Procelliiformes Order which also includes the Albatrosses – Diomedeidae Family which has 21 species. Most procellariids’ nests are in burrows or on the surface on open ground, with a smaller number nesting under the cover of vegetation (such as in a forest). All the fulmarine petrels bar the Snow Petrel nest in the open, the Snow Petrel instead nesting inside natural crevices. Of the rest of the procellariids the majority nest in burrows or crevices, with a few tropical species nesting in the open. There are several reasons for these differences. The fulmarine petrels are probably precluded from burrowing by their large size (the crevice-nesting Snow Petrel is the smallest fulmarine petrel) and the high latitudes they breed in, where frozen ground is difficult to burrow into. The smaller size of the other species, and their lack of agility on land, mean that even on islands free from mammal predators they are still vulnerable to skuas, gulls and other avian predators, something the aggressive oil-spitting fulmars are not. 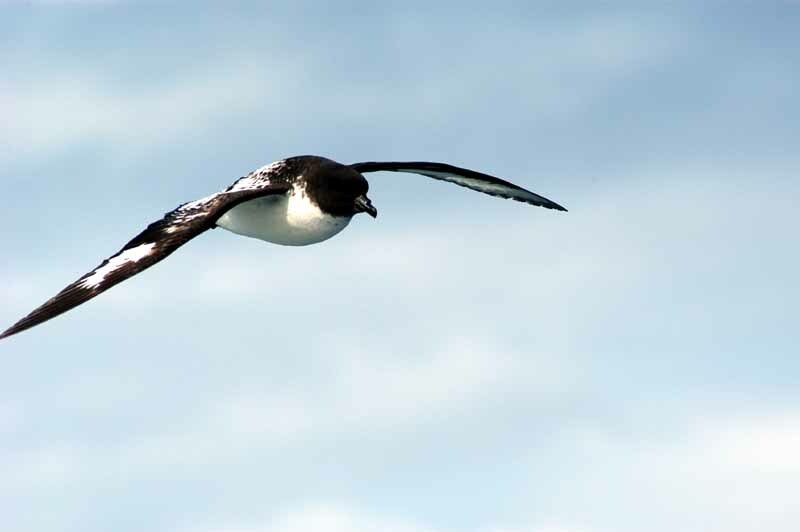 The chicks of all species are vulnerable to predation, but the chicks of fulmarine petrels can defend themselves in a similar fashion to their parents. In the higher latitudes there are thermal advantages to burrow nesting, as the temperature is more stable than on the surface, and there is no wind-chill to contend with.